(Note. Clicking on highlighted/underlined text or pictures will take you to the link. King George V Bowling green was opened by Mrs. A S Waller in 1962 as part of the King George V Memorial playing field in Howlbeck Road, Guisborough. 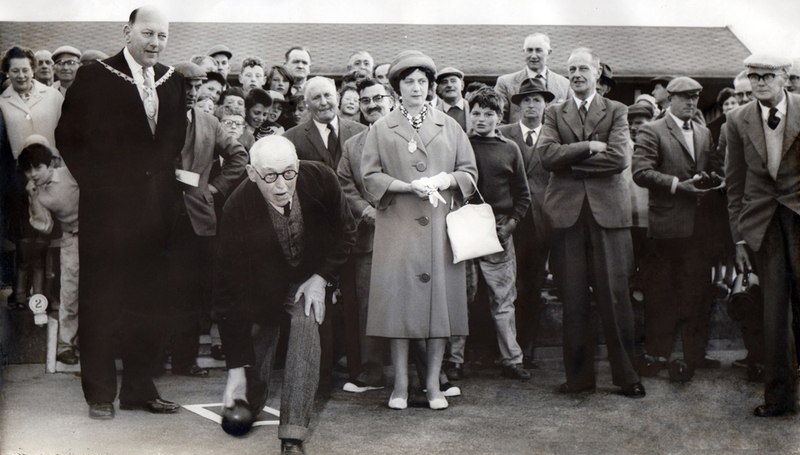 The picture below shows the first wood being bowled by Mr Jimmy Campbell who was the oldest member and a founder member of Guisborough Cricket Bowling Club (commonly know as Guisborough Bowls Club and now called Guisborough Priory Bowls Club). On the left of Mr Campbell is the chairman of Guisborough Urban Council, Cllr. A S Waller. 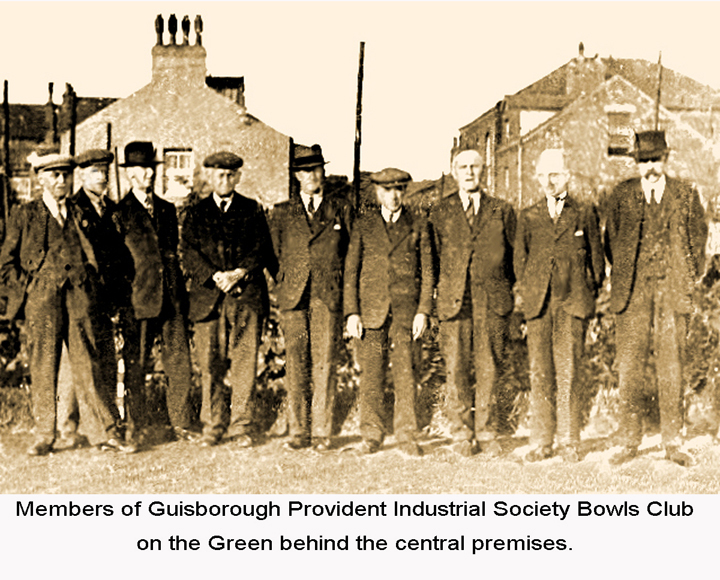 So, how did bowls originate in Guisborough? 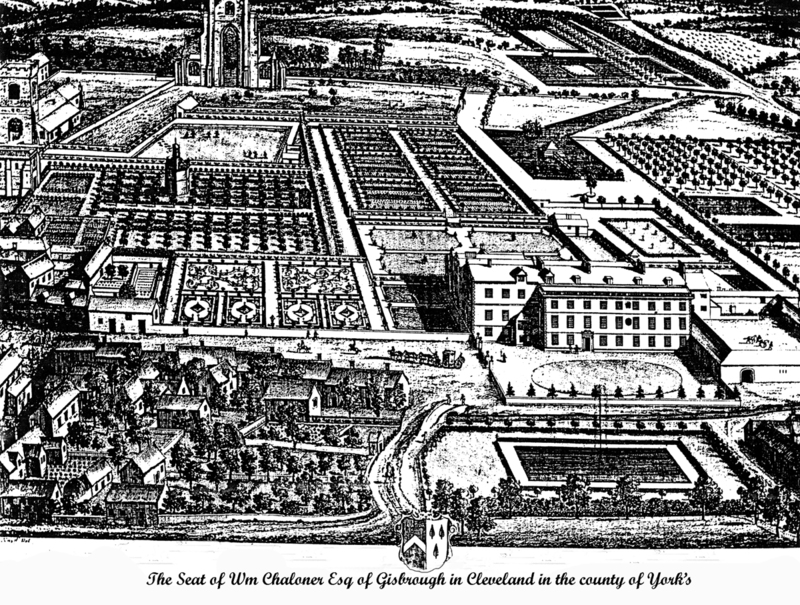 The earliest recorded evidence of lawn bowling in Guisborough comes in the form of a sketch by Leonard Knyff (1650 - 1721), a Dutch draughtsman and painter, who collaborated with Johannes Kip to produce views of country houses and gardens. His drawing of “The Seat of William Challoner Esq. 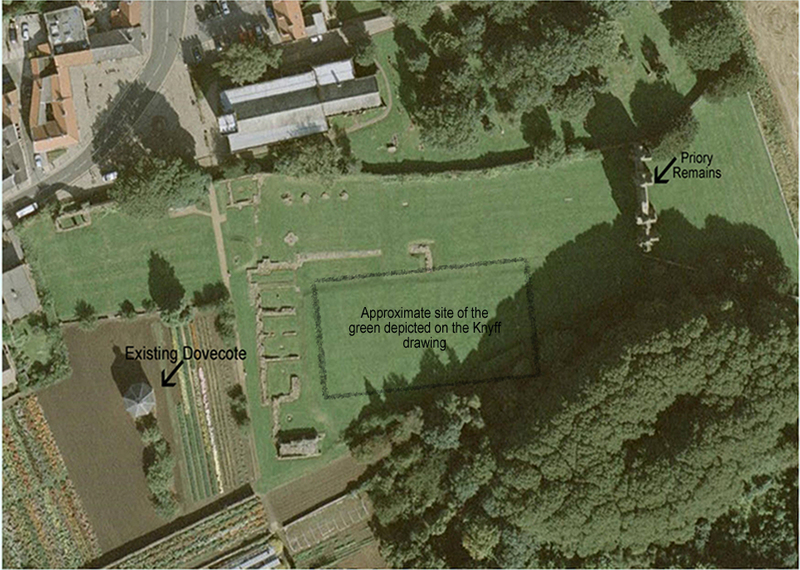 of Gisborough in Cleveland in the County of Yorke” shows what appears to be a bowling green to the west of the priory. This is supported by an ordnance survey type drawing dated 1773 clearly showing a bowling green in the same location as the one shown on the Knyff drawing. Although this bowling green has long gone, it can be seen from a more recent overhead picture that the plot of land shown on the 1773 survey drawing can be pinpointed in front of the priory by its trapezium shape. The dovecote, which is still in existence can also be used as a reference point between the latest view and the Knyff drawing. The Challoner building shown in the Knyff drawing was demolished around 1825 & presumably the bowling green was demolished with the estate. 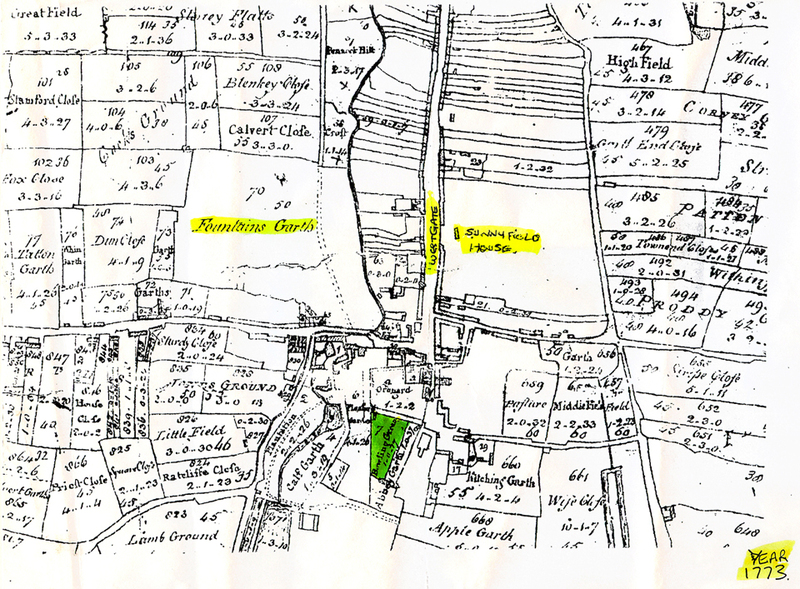 It is interesting to note that in the Knyff drawing, there is a fountain shown in the area in front of the old Gisborough Hall, this is now Bow Street/Fountain Street junction and the water from the beck was probably used for the fountain, this is probably why the road is called Fountain Street. 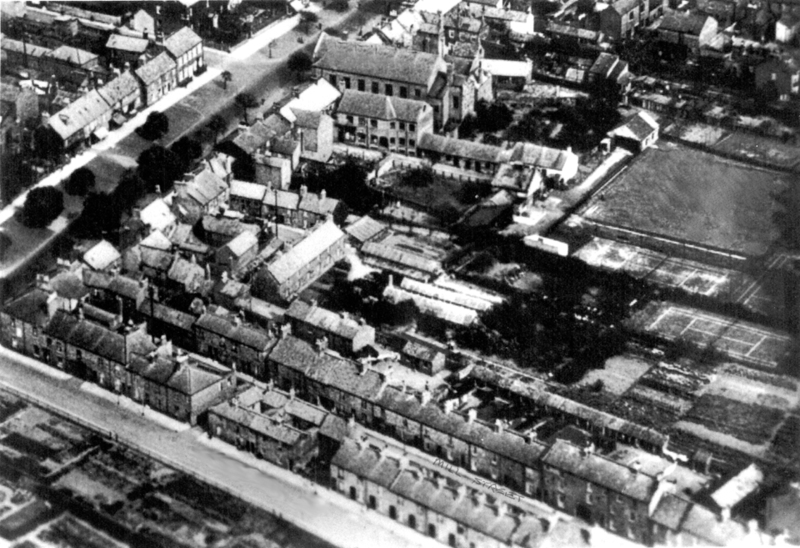 It is not known whether there was any continuity of bowling in Guisborough following the demise of the Challoner green, it is known however, that a bowling green existed behind the old Co-operative buildings off Westgate. An Aerial Picture clearly shows the green, alongside which are tennis courts. 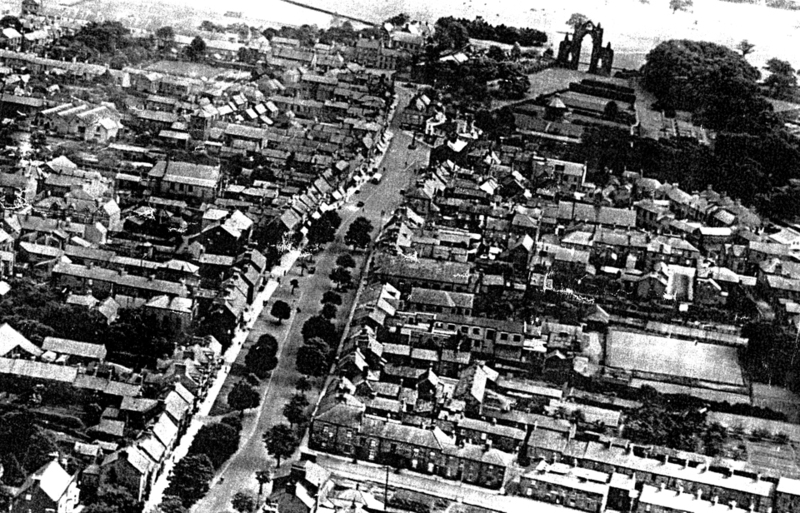 A further picture, a view from the West End of the town clearly shows the Co-op green and the dovecote and strip of land which was the old bowling green mentioned earlier on the Knyff sketch. The above mentioned pictures are reputed to have been taken in the 1920’s. Pictures from the Co-op bowling club show Members on the Green. Behind the green can be seen the tennis courts (marked by the pole fence) with Chapel Street beyond. A further picture Measuring the Shot shows the more formal attire that the bowlers wore in those days. One of the members shown in the picture is a Mr Mayhew. He was the Guisborough Branch Co-operative general manager and was also a founder member of the Guisborough Bowls Club and its first chairman in 1948. He passed away during 1949 and in his will he bequeathed £10 to the club. This was used to purchase a trophy which is still played for today as the mens singles championship competition and is still known as the Mayhew Cup. 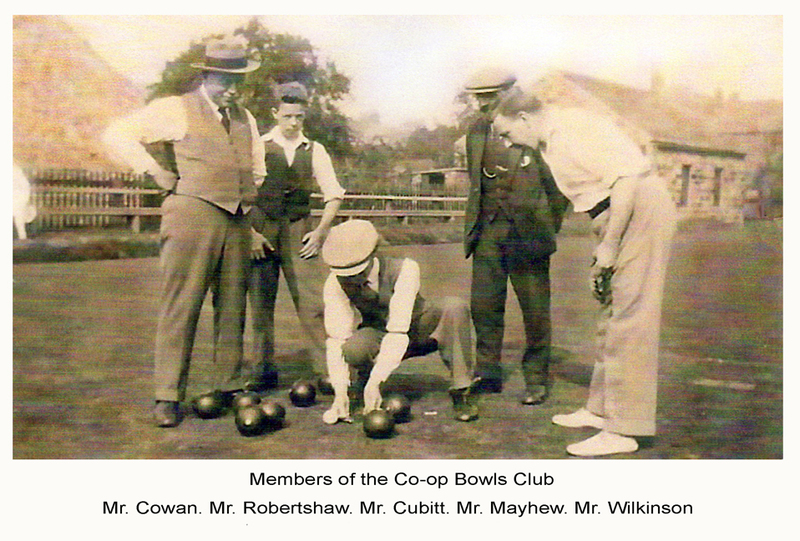 The Co-op bowling green was closed in the 1930’s to make way for the Co-operatives coal yard, with all bowling equipment being transferred to the Towns Cricket Club. The land is now part of the Morrisons store with the approximate area being the loading area to the rear of the store.